I have started experimenting different ways of tracking movement. 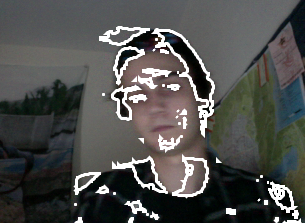 In the example below have used “opencv.findContours” and then set the contours found, to be drawn as white lines. This is a really good first step for the project as objects moving are changed and static objects are unchanged. This can reflect the difference between public performance and private performance as people moving through out the space the video captures are outlined distorting their appearance, reflecting that they are in their private space. Whereas, those who are still are not outlined making them easy to recognise and are publicly represented on the screen.